Bike sharing systems have become increasingly popular in larger cities around the world. But what if you could combine the practicality of these systems with solar power for e-Bikes, which many riders now prefer? Cities in Europe and China are taking the lead here, since most accept the idea of bicycling to short destinations, and an even greater number like the concept of solar wherever it can be employed to save the environment. New innovations in pedal assisted electric bikes (e-Bikes) have spurred a growing market for them worldwide. Such bikes are especially ubiquitous in China where 90 percent of them are sold. In fact, e-Bikes herald the arrival of electric vehicles on a massive scale in major cities in Sweden (not including trams and trains). The simple reason is that they combine both energy efficiency and economy compared to other electrified modes of transport. Riders like the fact that they can pedal farther with less effort, especially going uphill or against the wind. Even longer rides are no longer such a challenge, further reducing the need for conventional motorized transport. There’s no denying it: e-Bikes take the load of a rider’s legs and allow a person to go a lot farther. They rally come in handy for short hops to the store or park. Some cities are ramping up to install e-bike stations wherever people (tourists and residents alike) need to make short trips to work, a particular entertainment venue, or simply to explore the area. The hope is that people will be less inclined to use more expensive motorized transport—be it taxis, gas powered scooters, or their own cars. With e-Bikes, people tend to take longer trips than those associated with pure people-pedal powered vehicles. Powering these e-Bikes would involve a growing network of solar powered charging stations, a dramatic shift from fossil fuel powered transport. Solar panels mounted on the roofs of e-Bike stations could serve double duty, offering weather protection and a source of electricity to recharge e-Bike batteries. Drawing on free solar energy, e-Bike charging systems remain off grid, allowing stations to be conveniently placed where they’re needed most—near festival areas, sports events and busy shopping areas. Using solar power to charge an e-Bike offers a highly efficient mode of transport. That’s because a bicycle’s mass (even with motor and battery) is far less than a car’s or a scooter’s, and thus less energy is required for propulsion. What’s more bio-fuels or regular cycling calls for the conversion of solar energy to chemical energy, which is less efficient in converting energy than drawing electricity from a solar panel. Not surprisingly, e-Bike pools are not a novel concept. They’re found throughout the world in cities and towns where simple, sustainable transport is encouraged. Several pools have already been running for years. One can find e-Bike rental stations in Copenhagen (called GoBike), in Tokyo (Eneloop SANYO), in Knoxville (CycleUshare) and Stuttgart (E-call a Bike). Two of these pools are powered by solar panels: Eneloop SANYO and CycleUshare. 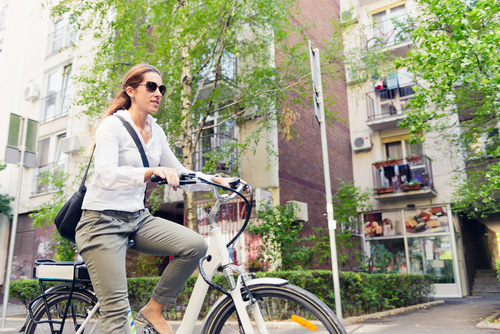 Bike sharing systems are currently available in nearly 1,000 cities around the world. In Europe, where cities are extremely dense, roughly one-third of car trips are shorter than 3 km, with half the trips being less than 5 km. So switching to energy efficient, less polluting e-Bikes makes sense. And powering these bikes with solar energy makes even more sense. It’s no wonder that Bike Sharing Systems (BSS) are currently in more than 600 cities globally.